I have just completed this review on a Chinese imported hand plane. This hand plane looks remarkably like the WoodRiver Hand planes supplied by WoodCraft, so I thought that you might like to read the review I wrote about a similar hand plane over here in Finland. The report is in pdf format which you can down load it if you wish to read the full report. 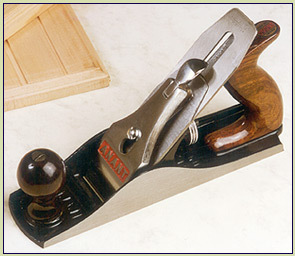 Summary: A well engineered hand plane, which has a positive feel to it as soon as you pick it up. The weight of the plane is a definite advantage in eliminating the chatter, normally associated with lower cost hand planes. After using this smoothing plane for a whole day, I found that it was a real pleasure to use – the results were first rate, as good as I can achieve on my more expensive hand planes. The only disadvantage I found was the size of the Tote/Handle, but this was not a major drawback. Conclusion: I would strongly recommend this particular hand plane as real competitor to other number 4 hand planes on the market costing 2 or even 3 times as much. Add a second blade for high angle work and this tool would cover most of your small project needs. I am looking forward to getting my hands on the remaining hand planes in this series to test and use. I have had the same experience with these planes. They work even better with a Lee Valley or Hock blade in them. Thes bllades are thcker and allow a beefier edge to reduce chatter. Would I trade them for Lee Valleys? – of course! In the meantime I have some darn good iron to work with with a modest investment. hmm. where do they retail in the US? They are a great tool, but I have to disagree with you about the Hock blades. The hock are 3/32” thick, whilst the blade in this unit is a full 1/8”thick, about 0.7mm thicker than the Hock equivalent. Also I prefer the chip breaker on this unit to the Hock version. Thanks for the news Tony. Mine were purchased about 3 years ago and the blades were about 2mm. I just bought a shoulder/rebate plane and am having to replace the blade before it will be serviceable. ah gotcha. so “remarkably like” means “probably identical” lol. thanks! This is excellent info for anyone on a smaller budget. where can you get em? sorry to look stupid tony…but you said it was Like that one, so i figured ur source would be cheaper? is $120 really the cheapest Cheapest plane you can get new? i remember some $20-30 HF ones.. The reason I said “remarkably like the WoodRiver Hand planes supplied by WoodCraft” was that I cannot confirm that they are by the same manufacturer. You can buy much cheaper hand planes such as Anant, but my Anant hand planes are gathering dust, so much so that it is difficult to find them any more. The old adage “you get what you pay for” does not apply in this case, I think that these planes are great value for money. I have used the Lie Neilson and Veritas #4 smothers and to be honest this plane is as good (a little fine tuning and tweeking, but the same for the more expensive planes). So you can buy a $25 and you will probably spend another $50 on a new chip breaker & blade and hours upon hours fine tuning it and you may never get right. Or, you could spend $120 on a plane like this, get a better blade (full 1/8” thick Vs 3/32”) than is offered in the more expensive tools, save a fortune vs. the more expensive tools, it will work directly out of the box (sharpen the blade) and hard pushed to see the difference in quality, if any at all Vs the more expensive planes. If you are near a Woodcraft store, I would recommend that you call in and ask for an in-store demo/trial, maybe Vs a L-N or Veritas, I am sure that you will be surprised at the quality of the lower cost version. This is one made by Anant in India. I beleive these are less expensive than the woodcraft offerings.